Are we referring to vocoder paint jobs as hero and stunt now? If you’re referring to my post, I specified “a little closer to a specific ANH Hero look” followed by a specific hero helmet from ANH. 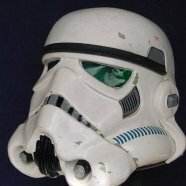 I am not saying that all hero helmets have the same as this specific trooper. You're right, there is still a small amount of return edge on the ears. My concern is that, if I trim any more off, the gaps between the ears and the mask/cap are going to keep growing. By leaving a little return edge, it keeps the connection tighter (or so I rationalize). It felt like the lesser of two undesirables. No it won't leave more gaps if you trim following the trim line, even so will still look better with a little gap than those huge return edges which you don't see on any movie helmets. Matt and Mark, thanks for your direction. Put up your dukes, Ears, it's time for round three. I read your post as Brendan needed to change the vocoder paint to match a stunt rather than a hero. The truth is there is no specific style to paint the vocoder regardless of being a stunt or hero helmet, As you can see on both Han and Luke's hero helmets. both vocoders are painted quite full. I'm just trying to keep up with you guys as I build lots of these helmets for people and I don't want them being knocked back because of CRL rules I am unaware of. Alright! One ear down, I think. Zero return edge! As predicted, it opened up the gap a lot more. Frighteningly, it opened it enough to reveal the cap underneath. Ew! To remedy this, I had to once again change where the screw hole is to pull the ear tighter to the helmet. This is the same ear (right ear) in which I earlier had to drill a second screw hole and filled in the original with PlasticWeld. The best look came from clamping the ear down and drilling a hole right at the bottom edge, where the S-trim covers. Thankfully, Mark sent a set of helmet screws with the kit, so I had a second set in addition to the ones from TrooperBay's helmet kit. Because the CRL requires a screw near the bottom of the ear, I cut one of my extra screws so I could glue it in the old, unused screw hole and fulfill the aesthetic requirement while the structural screw remains hidden beneath the S-trim. And the result! Still a bigger gap than before, but no return edge. Cutting off all that plastic felt like jumping into deep, cold water. Thanks for the push! I find my previous lack of faith disturbing. On to the left ear! I suppose it's all down to perspective and how picky you really want to be, there does appear a difference between Hero and Stunt as show below, Hero vocoder appears a little narrower and the tiers (steps) are a little lower on the sides. Stunt appears fuller. No matter what though Brendan your touch up to the vocoder looks a lot better now, good work. If you ever decide to get new ears pieces let me know, I can even trim them for you. If there is anything else I can do with what I have, of course I'm open to hearing it. Like I said, I'm pretty sure this is the best I can do. Is anything about this going to be a barrier to Centurion? Thanks for all of your ongoing help, everyone! Looking really nice. I know it seemed like a lot for just ears but they look great. I don't mind the work! It's just that constant, naggy fear of botching something up beyond repair. I dunno what I'd do if that happened—I don't speak botchi! Most of everyone’s mess ups are fixable. Some are just more extensive or require new parts. Most suppliers have stuff handy to sell if needed. Looks much much better, great job! Thank you! And thanks for all your help, Matt. :-D I appreciate it! First, I cut and trimmed the white pieces to the measurements depicted above. Without trimming the black PVC tube, the overal length was just under 8 1/4"—almost an inch too long. I marked the new length on the pipe, and cut and sanded it to size. Now the overall length is the desired 7 1/4". Huzzah! Turns out Mark includes them pre-painted with his AP thermal det clips! Thanks Mark! You're the best. And my little quest was fun and rewarding all the same—no time wasted where enjoyment was had. So now i've got some extra; if anyone has need, shoot me a private message and I can mail them your way. Back to the build. I taped the front plate into position and used a pencil to trace the edges, as well as those of the clips. Once marked, I removed all the hardware and put down a first coat of grey paint. And that's where she sits now, paint a-drying. As always, critique is hugely appreciated. Thanks everyone! Talk soon. Those are the wrong screws in the kit. Canadian Tire does have the right ones - they are brass pan head machine screws - hard to find. Don't sell the screws you ordered just yet. Ooo! Okay, thanks for the heads up. I guess I never actually compared them to the ones I ordered, I just saw that these were painted black and didn't think twice about it. Back to Plan A! The #6-32 brass slotted pan head (on the right). I grabbed the 3/8” long one but 1/2” is what Mark had used. This bolt has the same thread as Marks so you can use the same nut. Oh yes, once they're side by side I can clearly see the difference. Silly me! Do they need to be brass? They didn't have that option when I ordered them, but I didn't think it would matter since they would be painted black. Do they need to be brass?﻿ They didn't have that option when I ordered them, but I didn't think it would matter since they would be painted black. Nope. Just painted black. Brass is all I could find at Canadian Tire. Solid. Thanks for your help! You are very welcome, Brendan. Oh, one more thing. For the back part of your aluminum clips, you will want to round the corners a little bit and give them a little bend (see below). This makes it easier to get it on your belt. Awesome, yes I've seen others do that! What is the best way to create that little bend? I don't work with tools or metal very often. Also, I've seen others suggest to put a strip of soft velcro along the back of the clips to prevent them from scratching your armour (which is a great idea). Just wondering, does anyone ever add hook velcro to the back of the abdomen plate to help keep the thermal detonator attached and in place? Or does that cause other problems, like difficulty sliding it under the belt, for instance.